On this date, 26 years ago, I married my best friend. More than one-half of my life, I've shared with Ed. I remember the day so well. A beautiful fall Saturday in my hometown -- Sioux Falls. On that morning, I remember all the butterflies and all the excitement. I was thrilled. I remember my Mother asking me, "You love him today. Will you love him when you're both old and have grey hair?" That's hard to imagine at the age of 25. But, I remember answering her with confidence -- "I know I will!" And.....I do!!!! It's been a terrific 26 years. My only regret today is that we're not together to celebrate. But, as his card and letter told me -- we'll have many more special days in our future to celebrate other special days. I'll hold him to that! Something real funny happened here, and I just had to share it. All military installations have an office called the DRMO -- which stands for Defense Reutilization and Marketing Office. It's nothing more than a military junk yard. But all of those who have grown up thinking that one person's junk is anothers treasure would delight in rummaging through a DRMO. Typically, only the supply personnel "get" to go to DRMO. You'd be amazed what I've found for units over the years!!! The DRMO here advertised well in advance that they were allowing soldiers to come in and "shop". Of course, no one was charged a thing. It was basically a real "free" for all. Imagine an area about the size of a half a football field -- full of wooden pallets and boxes of green (some tan) stuff on the pallets. There were so many soldiers there -- everyone was attempting to be polite -- but really now, when you're dragging your prized possessions to look at the next pile of junk -- it's hard to remain respect and dignity. The funny part was the ladies that worked at the DRMO. Several had large "shopping" bags they were handing out to those whose arms were overloaded. Others were barking out -- "BOOTS -- GET YOUR BOOTS OVER HERE!!!" "JACKETS -- COME ON GUYS -- GET YOUR JACKETS HERE!!" They even had large coolers of bottled water for the shopper. (Remember in one of my previous posts that there is bottled water everywhere!) It was really a fun time!!! As we were leaving the area (six of us from my unit!) there was one lady who had a John Deere gator (forgot to tell you -- they're all over the theatre too!) and she was driving one guy over to his car, because he had so much stuff. I think she was too used to driving a forklift -- because all she kept saying was "BEEP" "BEEP" "BEEP" -- all the way out to the parking lot!!! It worked, because everyone did get out of her way! Nothing more to write about -- had to share my fun day! Ok -- I've been duly reprimanded from my children -- so I better post an update!!! It's hard to believe that today is my 62 day here in Kuwait. Time has truly flown by! We continue to work long days, but are able to get the better part of a whole day off now. My "somewhat" day off is Saturday -- and I do get to sleep in and be lazy for most of the day; only stopping in the office to take care of critical issues. 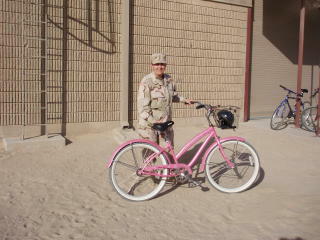 The pink bike has become my pride and joy around the Camp, as well as my signature around the base camp. It's the only one like it, and now people wave and say hi before I even get right next to them. It's not Barbie Pink. I like to call it "little girl pink"! I am usually on it daily, running from one office to another. Of course, I don't take it to the other camps. I'm sure the security at the gates would love to see me try getting off post with it! Note the basket -- it's great for carrying "stuff". Just for Tom -- I think I need a little stuffed poodle (one that looks like Chip!) and carry it around in the basket. As if the pink bike doesn't turn enough heads! The temperatures are getting a little bit better! They're down to 100 or 102 now!!! That's a good thing. The past few days have been extremely humid -- I admit, I was shocked that there would ever be any humidity in the dessert. If anyone knows any drug dealers (and I don't) you may want to inform them that Kuwait doesn't play games. Trials are quick (usually no more than a week after a crime is committed) and the punishment is swift. Last week there was an article published in the local English version newspaper that there was to be a public hanging. Yep -- right there in the town square. Pakistan is now short three citizens. About nine months ago, there was a civilian (not a Kuwaiti) who was driving on the highway here in Kuwait. There were two American soldiers on the side of the highway, changing a tire on a military truck. The guy obviously didn't like American's and swerved to hit them. Unfortunately the two soldiers were killed. So was the driver about 4 days later. They hung him too -- public square. OK -- enough gloom and doom. It's amazing all the different countries that have military here. Some of the more known Allies include the British; but I've seen so many more. Japan, South Korea, Australia, Macedonia, Italy, Slovakia are some of the ones that come to mind. Most of them speak English very well. I'm embarrassed that I don't speak any of their languages. Of course, the universal salute is always appropriate; and we salute their officers and recognize them just as we do our own. Some of the officers that are in my unit work very close with the Kuwaiti military. They were a patch on the breast pocket of their uniform that is equivalent to what they would be in the Kuwaiti military. It helps everyone recognize who outranks whom and who you need to pay particular attention to. Ed is busy back in San Antonio, ensuring the last minute details are handled with the housing project. We've been busy going over window stuff by emails and phone calls. Of course the things I had selected before I left won't fit the windows!!! Oh well -- I'm sure he's going to do well. This week has been frustrating. Although we're happy with the color of the brick we selected -- we're not so sure we want to advertise for Acme Brick for the remainder of the life of our home!!! The fireplace had 25 bricks that proudly displayed the Acme logo on them. Not in any particular order or place; just wherever the brick layer decided to be lazy. Then if that wasn't enough -- there are two brick archways that go from the dining area into the sunroom. Yep -- more Acme Brick advertising. He did manage to get that redone (at the dismay of the builder and the brick layer) -- then he noticed this week that the outside has several bricks showing the Acme pride!! He was shocked! Then he looked around at houses in the neighborhood -- it's rampant!!!!! I'd never heard of such a thing. Obviously the middle to high bid builders use the low bid sub-contractors when completing a task! He did get them to agree that they would replace all the "Acme pride" on the front of the house. But...if you ever want to know what company made the brick for our home, come check out the sides and the back. Unbelievable! He did get confirmation that we get the keys on October 31st!!! That's a good thing!!!! I better close -- I'll try to do better on my posts!